Hazardous area enclosures for Zone 1, Zone 2, Zone 21 and Zone 22 applications. 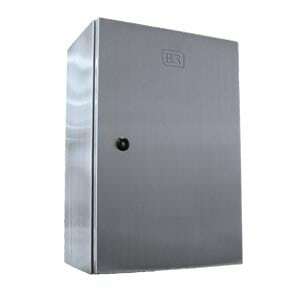 The flat roof screwed terminal box is made from 316 stainless steel and is suitable for hazardous Zones 1&2, 21&22 applications where flammable liquids, gases & vapours or combustible dusts are frequently present. This entry was posted in Enclosures, Ex e Enclosures, Hazardous Areas, Product, Stainless Steel Enclosures, Terminal & Control Enclosures, Terminal & Control Enclosures and tagged Color 316SS, IP66/67 on March 16, 2015 by Simon. This entry was posted in Enclosures, Ex e Enclosures, Hazardous Areas, Product, Stainless Steel Enclosures and tagged Color 316SS, IP66/67 on March 16, 2015 by Simon. 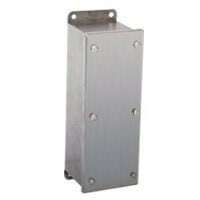 The sloping roof electrical box is made from 316SS and is suitable for use in Zones 1 & 2, 21 & 22 applications. This entry was posted in Enclosures, Ex e Enclosures, Hazardous Areas, Product, Stainless Steel Enclosures, Terminal & Control Enclosures and tagged Color 316SS, IP66/67 on March 16, 2015 by Simon.